Is Richard DeDominici an idiot? The relationship between art and sponsorship is continuously debated. The climate change crisis demands that we urgently re-examine this relationship. Is it appropriate for Britain’s cultural institutions to accept money from the likes of Shell and BP considering that Big Oil continues to devastate communities the world over and now threatens to wreck our planet as a whole? Platform London’s Picture This – A Portrait of 25 Years of BP Sponsorship charts BP’s major environmental catastrophes, human rights violations and backroom deals since the company first began sponsoring the National Portrait Gallery in 1989. From the Exxon Valdez oil spill to the Deepwater Horizon disaster, it’s a damning list. The National Portrait Gallery, British Museum, Tate, Royal Opera House, National Theatre, V&A and Barbican are among the many institutions that accept BP and Shell money. Yet, despite the large number of institutions they sponsor, the oil companies’ money equates, at most, to no more than 3 per cent of any institution’s total funding. The enormous amount of publicity received in return creates a myth that the survival of art is dependent on Big Oil. In return for their cash oil companies are offered legitimation by some of the UK’s most respected institutions – a social licence to operate. Through our tacit acceptance of sponsorship, we, as citizens, artists and appreciators of art, do the same. To challenge this myth, create a space to examine the ethics of sponsorship and ultimately take away Big Oil’s social licence, grassroots groups using creative expression as a tool for protest have organised as the Art Not Oil coalition. These groups are Liberate Tate, Shell Out Sounds, BP Out of Opera, BP or Not BP, Platform London, Rising Tide and the UK Tar Sands Network. Interventions include Liberate Tate’s performance art in BP-sponsored Tate galleries; Shell Out Sounds’ choir protesting against Shell’s sponsorship of London’s Southbank Centre; BP or Not BP’s Viking funeral for BP in dishonour of the oil-sponsored Vikings exhibition at the British Museum; and the coalition’s first joint production, 25 Portraits in Oil, created earlier this year to mark the 25th year of BP’s sponsorship of the National Portrait Awards. The movement is creating change. Last year, the Southbank Centre dropped Shell as a sponsor and the Royal Shakespeare Company downgraded BP’s visibility. 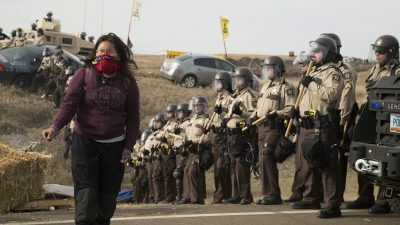 Media reports announcing this year’s Portrait Awards winner, Thomas Ganter, also mentioned the protests against BP sponsorship. The issue is becoming increasingly difficult to ignore. Recently, BP or Not BP co-hosted, with playwrights Mark Ravenhill and Caryl Churchill, a discussion event on oil sponsorship at the Royal Court theatre. The event brought together 70 playwrights, artistic directors, actors and development, marketing and fundraising specialists. It marks the potential beginnings of a unified sector-wide rejection of oil money. The event and performances build on years of behind-the-scenes work by Platform London to create ethical sponsorship options. There are those, such as Colin Tweedy in Artworks Journal, who argue that art has always taken money from dubious sources and in the process makes ‘bad money good’. But no amount of art sponsorship can restore dignity to oil-bespoiled communities in the Niger Delta or the Gulf of Mexico. Nor can it reverse the reluctant migration already happening in Bangladesh and parts of the Pacific as a result of climate change-attributed flooding and rising sea levels. So no, Richard, you are not an idiot. There have always been artists, albeit in the minority, who have been critical about art’s relationship with dubious industries and governments. You have joined a movement that categorically says art not oil. You have joined a movement whose time has come. Why are wind farms sparking protest?